471 in stock Need More ? 'A beautifully told story of real love and real life. I loved it' Miranda Dickinson'One of my favourite books of 2019. Astounding' Nina Pottell, Prima MagazineIf you are looking for the perfect love story to launch you into the Spring, then escape with the book readers are calling 'happy, sad, emotional & uplifting', 'heartbreaking' and 'real and honest. '________________________________The rules are simple: choose the most significant moments from your relationship - one for each hour in the day. You'd probably pick when you first met, right? And the instant you knew for sure it was love? Maybe even the time you watched the sunrise after your first night together?But what about the car journey on the holiday where everything started to go wrong? Or your first proper fight?Or that time you lied about where you'd been?It's a once in a lifetime chance to learn the truth. But if you had to be completely honest with the one you love, would you still play?For Esme and Tom, the game is about to begin. But once they start, there's no going back . . . 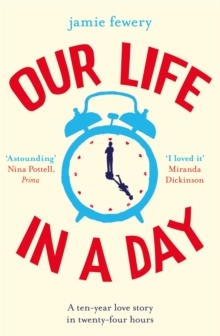 Following Esme and Tom's relationship over twenty-four individual hours of ups, downs and everything in between, Our Life in a Day is the most heartbreaking and moving love story you'll read in 2019 - perfect for fans of Josie Silver's One Day in December, Jojo Moyes, and Roxie Cooper's The Day We Met. ________________________________WHAT REAL READERS ARE SAYING:'Oh my heart. I absolutely loved this book' Jo'Heartbreaking but brilliant' A.